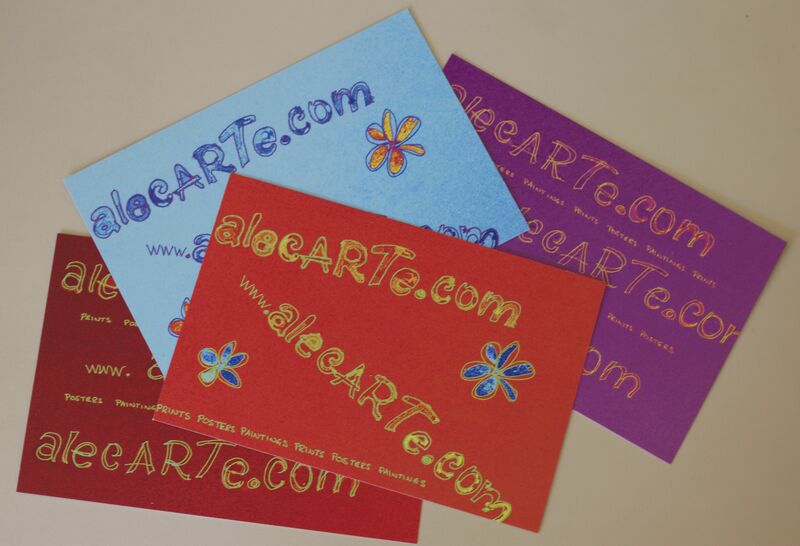 We wanted a nicer way to send a receipt to our www.alecarte.com customers than just a printed A4 sheet, and hit on the idea of designing and printing a postcard that we can include with each sale, with a hand written, individual message on the back. The cards arrived today, and we are really pleased. There are a couple more colours than featured in the photo, and they are all eye-catching. The sort of thing that customers will be able to find easily if they are looking through their paperwork to see who they bought that wonderful picture from. It’s the business idea that keeps on giving, because in addition to featuring the alecarte.com URL on the front the back also has a URL for RedBubble, so people can find more of my work that way too. We can use the cards in other ways than for receipts – they could stand in as a large business card or compliments slip. So there you are – my free gift to you today is a suggestion you might be able to adapt for your own purposes! Hope it helps! !